This is the sixth post in a 6 part series on how I using social media. In this sixth installment, I discuss measurement. There has been discussion about how to measure social media and can it truly impact your bottom line. The same could be said of public relations. In the end, it’s measuring what counts for your business. Subscribers, Followers, Fans: One way to track the success of your programs is by the steady growth of subscribers to your blog, followers on Twitter or fans on Facebook. Feedburner is a nice way to track subscribers to your blog or any RSS feed that you create for corporate updates, such as press releases, newsletters, etc. Audience Reach: The key aspect of social media is tracking “word of mouth” or the reach of your content to your key audiences. Twitter – Tweetburner allows you to create a short URL for Twitter and then tracks who has retweeted the link or clicked on it. You can keep your stats private or public. While this is a great tool, I’ve found that people will create their own short URLs for the content, so you may want to actively search on your Twitter ID for possible retweet. I then add up the number of subscribers for these individuals to get a “number” regarding reach. Online Reputation: Another way to determine reach is to track who is talking about you online. I wrote a bit about this in my second post – Using Social Media: Part 2 – Search Feeds. The added component is determining the reach of these online outlets. While ad equivalence can be used too, I’m not a fan of this method as I point out in my next bullet point. Incoming Leads, Inquiries: There are a couple of free tools such as Quantcast and Google Analytics that provide good detail about your incoming traffic. The key is to closely track the referring sources for the incoming leads and the conversion rates. For example, Twitter is quickly becoming a driver of traffic to my blog or answering a question on LinkedIn can lead to an inquiry about your services. Increased Links: Before you start your programs, take a quick snapshot of sites that link to your website. While a basic stat, this can have huge SEO implications for your site, which in turn, increases your visibility on search engines. Check to see if your efforts increase this basic stat. Conversation Index: Steve Boyd discusses the Conversation Index as a way to determine which blogs are successful. Basically, successful blogs are those have a more comments than posts. I would think that the same value can be applied to Twitter, LinkedIn and Facebook. The more that people interact with your company and messages, one can assume the more engaged they are with you. No matter what you do, measurement has to be an integral part of your program. Identifying the key data points relevant to your business, you can better justify these programs to your executive management. And who can argue with a program that has a low cost per lead and high conversion rate for sales? Since I first started tweeting on Twitter (thanks Jeremiah! 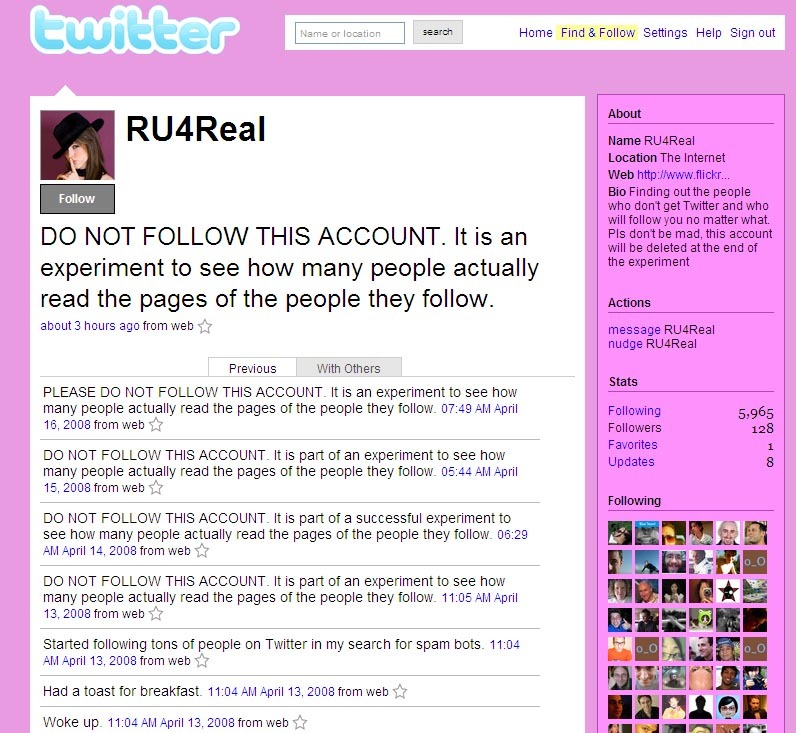 ), I have learned some additional tricks for maximizing my time and presence on Twitter. My main difficulty was how to manage more than one account for person and work related tweets. That is until I found out about Twhirl. Starred items are unread tweets. I can either click on tweets to indicate read or mark all tweets as read. Mouse over someone and be able to send a message, direct message, mark a tweet as a favorite, or retweet something with just a click of the mouse. 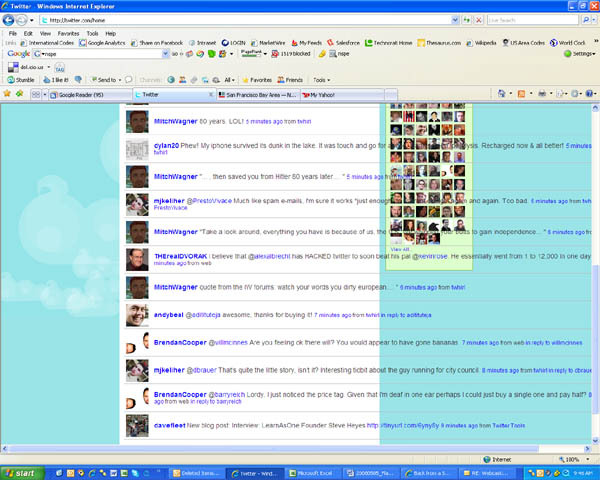 Twitpic – I haven’t tried this but can see this as a valuable way to share images. Search is actually integrated with the solution versus having to go to a different page to find people. And while Twitter has disable people search recently, Twhirl has not. If there are specific tweets I want to favorite, I can do this. Especially useful for saving links people have tweeted about. 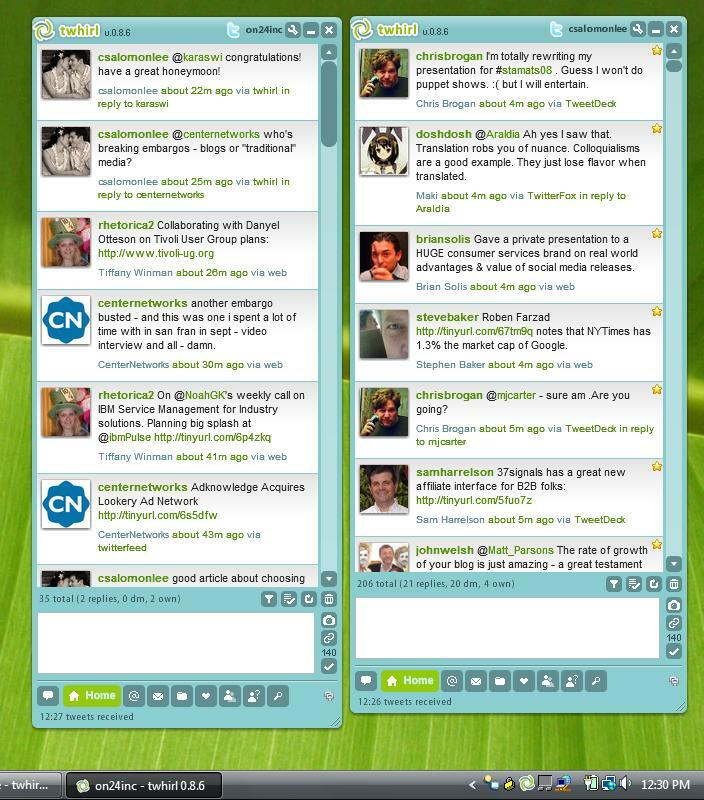 Overall, I am loving Twhirl as a way to manage multiple twitter accounts for personal and business purposes. One thing to keep in mind is tracking the clicks of the links posted on Twitter. Mack Collier just wrote about Tweetburner and Ellie of HubSpot commented on other ways to track the links in the comments. 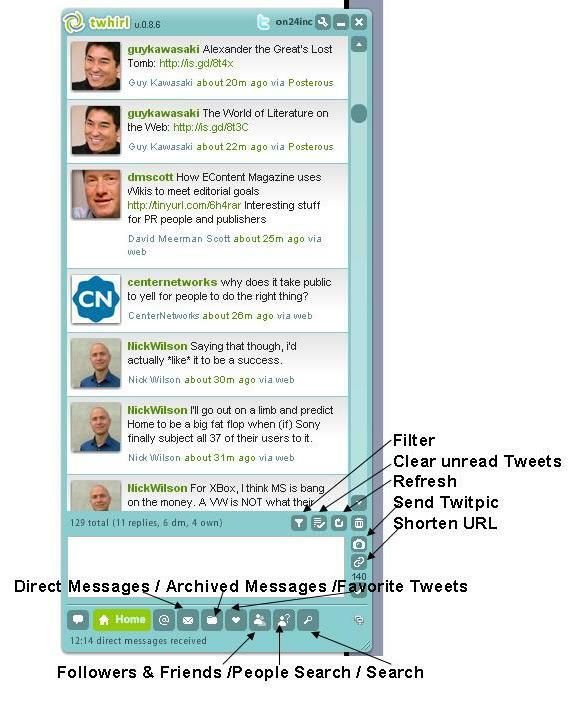 I would also check out Dave Fleet’s article on tips for new twitter users. I usually follow people on Twitter that have something to say and is related to my career. I always found it interesting when people just followed everyone. So when this twitterer recently “followed” me, I was intrigued. he or she (I’m assuming she due to the image) is trying an experiment. She is trying to figure out how many people just blindly follow people without checking out the content of twitterer. When I last checked, this person was following over 5900 people with 155 reciprocating. This raises an interesting question about the psychology of following. When I first started Twitter, I felt that I had to follow everyone who followed me. Otherwise, I would be dissing someone. Now I don’t necessarily follow everyone – I just don’t have the brain power to process that many people. I will also occasionally unfollow folks who haven’t really participated in conversations. I think it’s key to recognize that social media can increase one’s social network. Just remember, you can only create a nework that YOU’RE comfortable with. YOU create the network. It doesn’t create you.